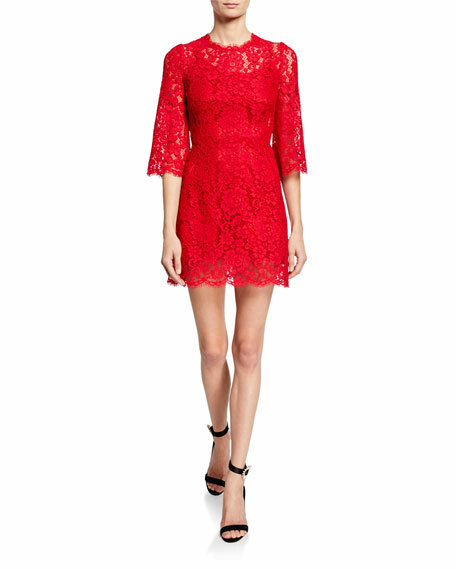 Dolce & Gabbana dress in cordenetto lace. Dolce & Gabbana dress in shimmery, ruched tulle. Square neckline; full lace-up front. Long, sheer sleeves. Bustier seams. Body-conscious silhouette. Dolce & Gabbana dress in shimmery, ruched tulle. Square neckline; full lace-up front. Long, sheer sleeves. Bustier seams. Body-conscious silhouette. Knee length. Nylon/silk/polyester. Lining, silk/spandex. Made in Italy. Dolce & Gabbana dress in floral print chiffon. Crew neckline. Short puffed sleeves. Self-tie sash at waist. A-line silhouette. Midi length. Silk. Lining, silk/spandex. Made in Italy. Dolce & Gabbana dress in patchwork floral-print poplin. Sweetheart neckline. Short puffed sleeves. Self-tie sash at waist. A-line silhouette. Tiered skirt. Knee length. Shell and lining, cotton/nylon/spandex. Made in Italy.